Hey y’all. I’ve disappeared from the blog, apparently, but the life update is this: I’m in America, Michael is in Asia, and all is well. Baby girl is still a girl, best we can tell, and I’m hanging out with my parents in Alabama until Michael gets back in May. We’ve been sad to be apart (a measly total of not quite six weeks: how on earth do military families do it???) but I’m thankful for time with my family in the meantime. I’m way behind on things that have happened in our life, but here are some photos from Asia just before I left. The Saturday before Easter, we went with some friends to a (sort of) petting zoo about an hour from where we live. We had fun hanging out and saw some cool stuff, but–not gonna lie–parts were really sad as some of the animals seemed to live in less than ideal situations. The low-light was a tie between the performance featuring a dancing bear and monkey performing to blaring pop tunes, and the lion cages (more on that in a minute). Still, we enjoyed one another’s company and–look on the bright side–when else can you feed a giraffe or pet a baby leopard? 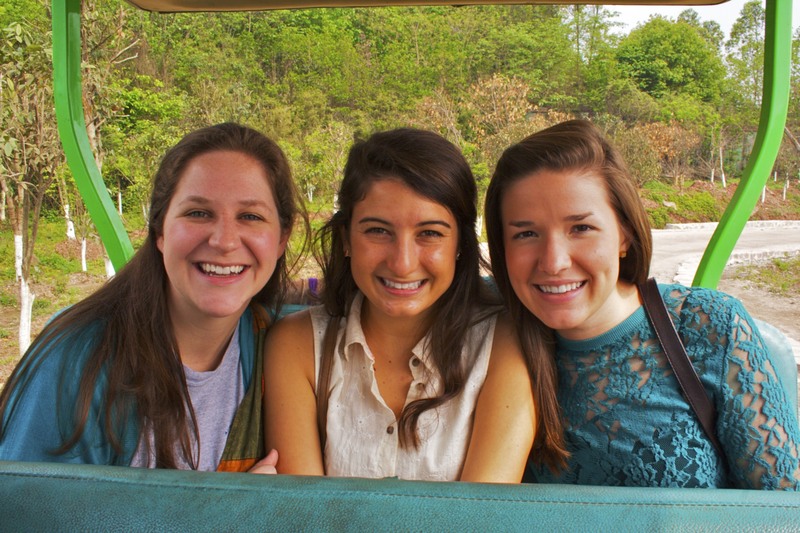 Meredith, Sam and Kelsey in our safari golf cart. The first stop of our tour was this yard (fenced in so we didn’t get to pet anything here) with kangaroos. The worker walked out with this bag and out popped baby Roo! Then we went to the giraffe area and got to feed and pet the giraffes. I freaked out a little. Post-giraffe and after we walked out on the dancing bear performance (we just couldn’t take it anymore!) we found the tiger enclosure. In the zoo’s defense, apparently the big cat area is under construction and will be open in May, but y’all, it was so so sad to see this whole row of tigers locked up in little cages. Also, scary. These cats were not happy campers and there was some roaring going on. Also some fighting: these guys were getting after it. The coolest part by far was when we walked out of the tiger cages to find this guy taking a baby leopard out of a cardboard box. A crowd quickly formed, but we were able to pet her and play for a bit. 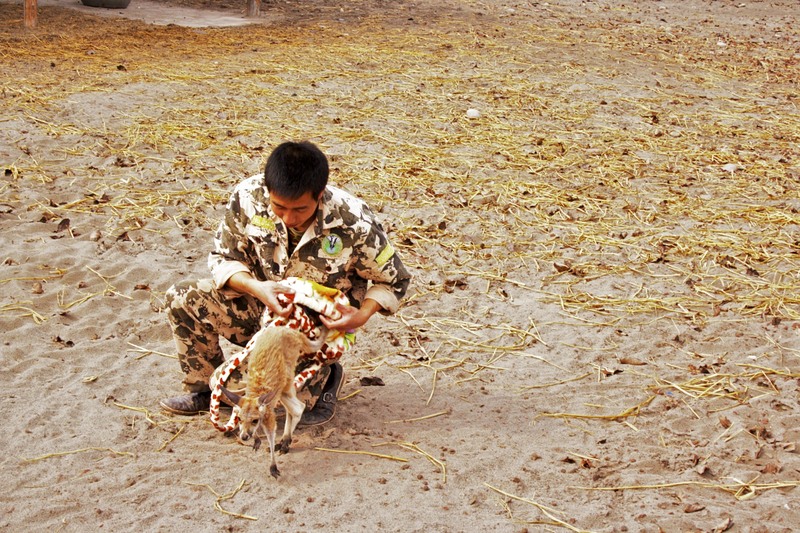 I did feel comforted because this worker (same guy with baby kangaroo) really did seem to care about the animals and enjoy playing with them.